Adventures in Teamwork! challenges group members to think critically, communicate effectively, solve problems creatively, display leadership, and take risks. Peak Performance!™’s professional facilitators use fun and engaging experiential activities as metaphors for real life challenges. 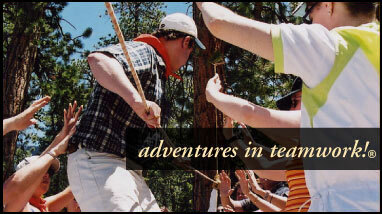 In a study of the effects of an experience-based training and development program, Litterini found that “Many of the Institute participants praised the ability to learn by doing and therefore enhance their understanding of the content.” Our programmatic activities involve adventure, excitement, and heightened emotions. Participants inevitably find themselves absorbed in activities and deeply invested in outcomes--a perfect situation for learning. When individuals are fully engaged (physically, intellectually, socially, and emotionally) in discovering information, they learn more...andthey retain more of what they learn. Our repertoire of challenging activities, simulations, and exercises provides an ideal context for individuals to discover new information and try out new behaviors. Dr. Simon Priest’s research supports this combination of approaches. Participants can experiment with solutions to real life situations without real life consequences. The learning process is accelerated because feedback is immediate, concrete and visible to all. Participants transfer their learning to their everyday lives with the help of facilitated discussions and other reflective activities. The experienced Peak Performance!™ staff guide the participants in their exploration. Aligned with the definition Simon Priest gave to experiential education as “learning by doing with reflection," our staff work to ensure that participants derive the greatest possible benefit from a program and internalize the lessons learned; staff shape activities, then help participants reflect upon their experience. Discoveries endure whenmade in the midst of exhilarating, unforgettable accomplishments. While the first thing you might remember about a Peak Performance!™ program is the excitement, adventure or great fun you had, the effects of these adventures run much deeper. In a supportive atmosphere, participants in our programs gain new skills and enhance existing ones. In a study by Quinn and Vogl (1992), participants were found to clearly improve communication and conflict management as a result of their corporate adventure program experience. Skills crucial for success in life (communication, problem solving, teamwork, appropriaterisk taking and goal setting) form the foundation of Peak Performance!™ activities. Peak Performance!™ programs offer new perspectives. Through cooperative learning, participants develop more positive attitudes toward people. Working together to solve common problems, they learn the value of diversity; they learn to appreciate the contributions made by others, and they come to experience the joy of supporting other people in their endeavors. Our programs help individuals gain insight into themselves. When personal boundaries are stretched, new strengths are uncovered. With renewed spirits, heightened self-awareness, and increased confidence, individuals learn to recognize and take responsibility for self-limiting behaviors. The exhilaration and fun of Peak Performance!™ programs may be unforgettable, but equally enduring are the new skills, attitudes and self-discoveries that are learned. Our clients regularly report significant, positive, lasting change in participants. And that’s what’s most important--Peak Performance!™ Leadershipprograms work!